When things don’t make sense, do you embrace your life’s journey with a new perspective and commit to the possibilities all around? 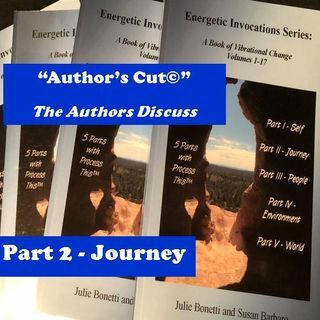 If you want to learn how your expertise actually encourages your value, and how your value relates to your currency (which is so much more than money), join the authors’ discussion of Part Two, “Journey,” from “Energetic Invocations: A Book of Vibrational Change” and “Energetic Invocations Series: A Book of Vibrational Change – Volumes 1-17, with Process This™ ... See More (with real-life situations and contemplations). Buy the book, hear the discussion, and fill your journey with self-empowerment!